I’m proud to serve on the board of Fish Florida (http://www.fishfloridatag.org/), a non-profit organization that helps people, particularly children, learn more about fishing in Florida, and its related environment. Since its inception in 1998, Fish Florida has helped over 300,000 children learn how to fish, by supporting fishing and conservation educational programs through tackle donations, grants, and scholarships for marine and aquatic students. The Fish Florida funding is acquired from the sales of its sailfish license plate. 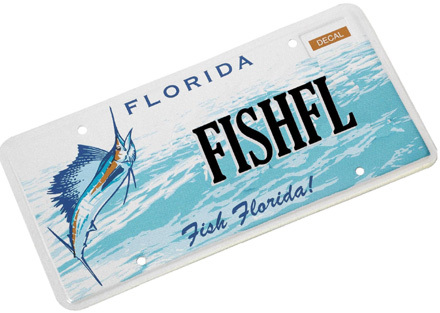 Every time an angler purchases this specialty Florida license plate for their car, truck, or trailer, Fish Florida receives $ 22.00. 218,000 kids with their own rod and reel combos, so they can learn to fish and become ethical anglers. 15 Scholarships ($60,000) to marine science students. 115 Grants ($543,000) to programs teaching fishing and conservation to Florida families. And, since July 1, 2013, Fish Florida has given out 6,865 rods and reels and $27,200 in grants. The Fish Florida plate is available at local Florida tag agencies and at http://www.myfloridaspecialtyplate.com/fish-florida.html.